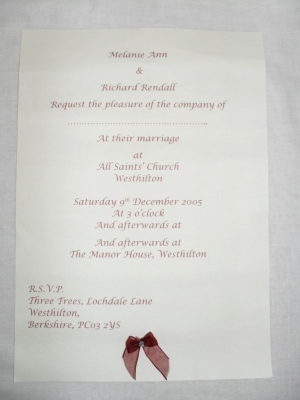 A beautiful classic ivory scroll invitation. 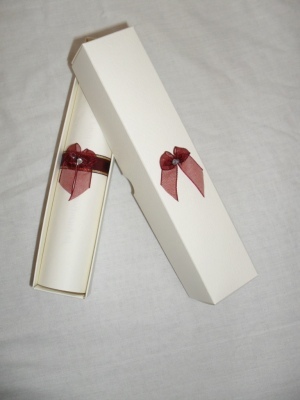 All your wedding details are printed onto an A4 size ivory textured paper in burgundy text with a burgundy bow placed at the bottom of the invitation, then rolled up and secured with a burgundy silk ribbon with gold edging and burgundy bow, this is then placed ionto a matching ivory textured box which has been finished off with a burgundy bow. This wedding invitation is also available as a evening invitation, engagement invitation or anniversary invitation. other coloured text and matching bows are also available, just email me for details.